Glens Falls is ready to make their city parks better. After partnering with the Creating Healthy Places to Live, Work and Play program, the city is making plans to revitalize their parks, and wants YOUR opinion! Creating Healthy Places is put on by the Glens Falls Hospital and aims to prevent and reduce obesity, diabetes, and chronic diseases in both children and adults. The program is funded by the New York State Department of Health. 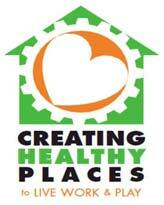 Creating Healthy Places goes beyond the traditional methods of just focusing on proper exercise and nutrition. It works to create opportunities for people to access healthy food. The program also wants to provide safe, convenient places to get exercise, hence the revitalization of the city parks. The city is asking the general public to participate in a survey about what they would like to see in the new parks. You can take the survey online or you can obtain a paper copy at the following locations: the Crandall Library, the Glens Falls Park field houses, the Glens Falls Hospital, and all of the Glens Falls public elementary schools. So have your opinions heard and help the city improve it's public parks! For more information please contact any of the program coordinators: Melissa Chinigo at (518) 926-5967, Kathy Varney at (518) 926- 5906 or Erin Krlvltski at (518) 926-5919.